Are you a Head Start director, in the process of developing a research-based coaching strategy for your education staff so that you are in compliance with the Head Start Performance Standards? 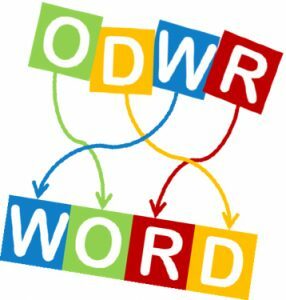 Are you an agency that hires staff to facilitate peer-to-peer networks and need an inventory of dispositions, knowledge, and skills necessary to hire the best staff? Are you in an organization that is looking to create a mentoring position and need ideas for a job description? In late June 2017, nearly 70 technical assistance (TA) professionals from a wide range of disciplines who support Maine’s diverse early childhood workforce gathered in Hallowell, ME for the rollout of the Technical Assistance Competencies for Maine’s Early Childhood Workforce. 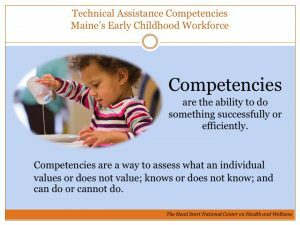 The purpose of Maine’s Technical Assistance Competencies is to improve the quality of early care and education by providing professional development that supports a highly competent workforce and address some of the needs listed above. 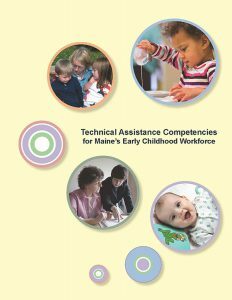 Download the Technical Assistance Competencies for Maine’s Early Childhood Workforce (2017) [PDF] here. 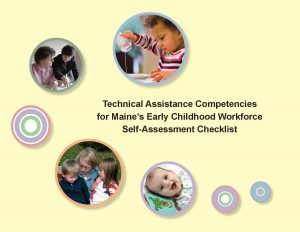 The Technical Assistance Competencies for Maine’s Early Childhood Workforce Self-Assessment Checklist (2017) [PDF] is a companion to Maine’s TA Competencies. This checklist supports technical assistance (TA) professionals in assessing their skills within the five competency areas. 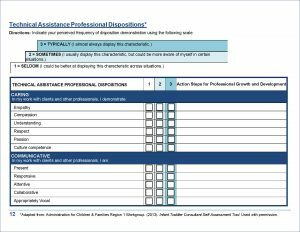 Guided by the results of the self-assessment checklist, TA professionals can complete the professional development plan to identify areas for ongoing professional growth and development. The checklist can be downloaded and completed electronically. 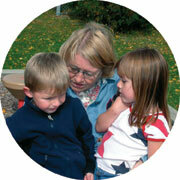 Download the Maine TA Competencies rollout presentation (PDF) here. Download the Match the Technical Assistance Request to the Technical Assistance Role (PDF) activity here. 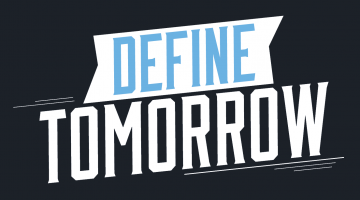 Download the Maine TA Competencies’ Key Definitions (PDF) here. 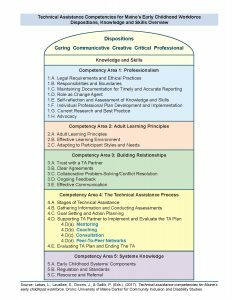 Download the Maine TA Competencies’ Dispositions, Knowledge and Skills Overview (PDF) here. 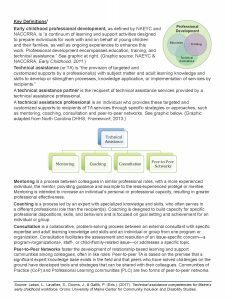 Technical Assistance Competencies for Maine’s Early Childhood Workforce (Labas, Lavallee, Downs & Gallik, 2017) includes five attributes, known as dispositions, of effective TA professionals: Caring, Communicative, Creative, Critical, and Professional. These dispositions were developed by an Administration for Children & Families Region 1 Workgroup for the Guide to Effective Consultation (PDF), and were informed by The Iowa Disposition Model: A Framework for Developing Effective Teacher Dispositions. 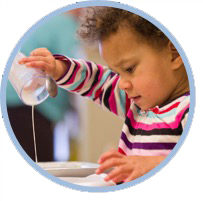 Technical Assistance Competencies for Maine’s Early Childhood Workforce (2017) was developed with funding from the U.S. Department of Health and Human Services, Administration for Children and Families, Early Head Start/Child Care Partnership Grant to grantee Kennebec Valley Community Action Program (KVCAP). Other collaborators include Educare Central Maine; Maine Roads to Quality Professional Development Network with funding from the Maine Department of Health and Human Services, Office of Child and Family Services, Child Care Development Block Grant; and the University of Maine Center for Community Inclusion and Disability Studies with funding from the U.S. Department of Health and Human Services Administration on Intellectual and Developmental Disabilities, Grant No. 90DD0005.